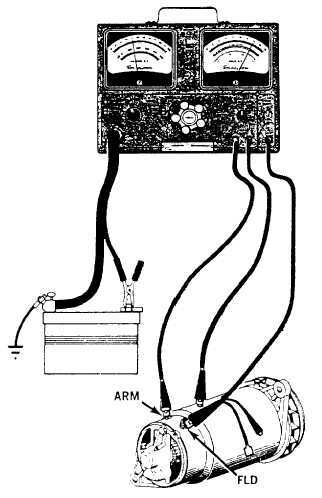 jumper and observe the ammeter for output. An output at this point in your check indicates a blown fuse. To conduct an excessive output test, set the volt range knob to the correct voltage range and the volt lead selector to the EXT VOLTS position. Connect the black external volts lead to the generator armature terminal and the red external volts lead to the generator frame or a good ground. While observing the VOLTMETER scale for the highest voltmeter reading, start the engine and slowly increase its speed. If the voltmeter reads less than 16 volts (12-volt system) or 8 volts (6-volt system), the current limiter relay of the regulator is the reason for the high output. If the voltmeter reads more than 16 volts (12-volt system) or 8 volts (6-volt system), remove the FIELD wire at the regulator and observe the AMMETER scale. When the ammeter reading shows no output, you have a defective regulator which should be repaired or replaced. When the ammeter reading indicates a current flow, remove the field wire at the generator and observe the ammeter. If the ammeter reading then shows no output, you have a shorted field wire. Replace the field wire and connect the generator to the regulator. On the other hand, if the ammeter shows that current is flowing, then the generator has a grounded field. Another component of the vehicle charging system you should test is the VOLTAGE REGULATOR. If the results of the test indicate the voltage is too high or too low, a faulty regulator voltage limiter or a high-series resistance in the charging system could be causing the trouble. Erratic or unstable voltage indicates poor circuit electrical connections, faulty regulator contacts (burned or oxidized), or damaged regulator resistors. In any case, you should proceed with a charging system circuit resistance test.